Frank Lincoln Mather, ed., Who’s Who of the Colored Race, vol. 1 (1915). Charles Battle, son of Benja Sorsby and Edith Battle, married Lear Hargrove, daughter of Alfred Parker and Venice Hargrove, on 20 June 1869 in Wilson County. In the 1870 census, Rocky Mount, Edgecombe County: blacksmith Charles Battle, 27, wife Leah, 29, and daughter Susan, 9 months. In the 1880 census, Wilson, Wilson County: blacksmith Charles Battle, 35, wife Leah, 30, and children Adelia, 5, Geneva, 2, Virgil, 1 month, and Nicholas, 18. In the 1900 census, Wilson, Wilson County: blacksmith Charley Battle, 50, a widower; son Charley, 10; and Menerver Edwards, 58, a hired washwoman. In the 1910 census, Stantonsburg, Wilson County: blacksmith Charlie Battle, 60, and son Charlie Jr., 21, also a blacksmith, were lodgers in the household of widowed farmer Sarah Artis, 48, and her children Willie, 22, Lillie G., 16, and Nora, 10, grandsons Marcellous, 14, and Alexander Artis, 10, and son-in-law Paul Harris, 22. 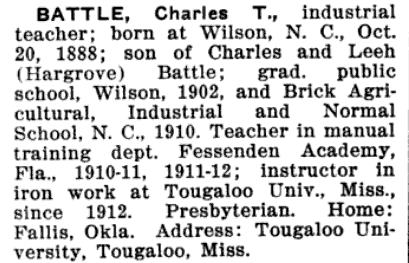 In the 1920 census of Iowa township, Logan County, Oklahoma: North Carolina-born, 30 year-old public school teacher Charles T. Battle [son of Charles and Leah], Alabama-born wife Leana, 25, and son Charles T., Jr., 1 year. In the 1930 census of Mobile, Mobile County, Alabama, on Cedar Avenue: 41 year-old insurance collector Charles T. Battle, wife Leana, 32, and children Charles T., 11, Barbara G., 7, Elliott F., 5, Lya G., 4, Earl P., 11 months, and sister-in-law Ethel L. Peters. ← Five daughters, four days.